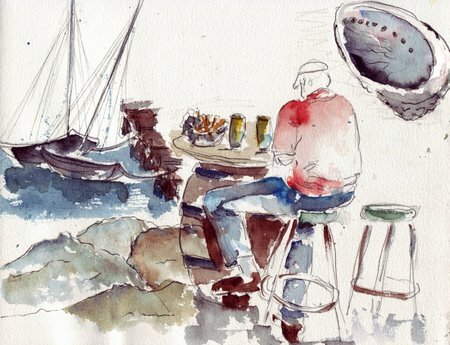 a Taste of life by the sea; boats of course, some abalone; more precious than diamonds, a view on mountains in the distance, sipping something cool and indulging in freshly caught calamari…thoughts and emotions haphazardly all on one page. How can one grow old spiritually when having the sea as company every day? I know of men and women who lived by the sea, off the sea and they saw ninety years, a hundred years and still counting. They have lived by the rythm of the moons, the directions of the winds, they took what was offered by the tides and accepted the moods of the skies. Like Proust says: “We don’t receive wisdom, we have to discover it after journeys taken”…so doesn’t wisdom only arrive after we’ve gone through some struggling? Don’t we grow after we have suffered some? When looking at life by the sea, in the sea, we’ll see evidence of that. I see it regularly just looking at La Loire outside my window; the birds who nest hopefully and optimistically on the islands in the Loire, just to have it all flooded away few days later. Yet, they come again and again with their hope and optimism. Nature teaches us by example. I wonder if we’ll ever learn from it, seeing how we eat imported foods and sigh heavily when it’s not available, jump in our cars to drive 5 minutes for a DVD, complain about trivialities….A life lived in harmony with nature may not be a luxurious one, but it is certainly an enriching and fulfilling one. 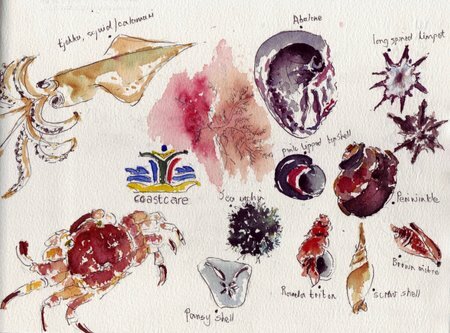 Sketches done in sketchbook on site (except for a few shells), 19x25cm, with pencil, pen and watercolours. and sea life…in a rainbow of colours and dazzling shapes…. How then, can one grow old by the sea…? Just to say that I don’t know what happened to my sketches but I’ve put it again and think that now it’s o.k. I’ll come back to see your new ones. You did get to use that beautiful new palette – often! 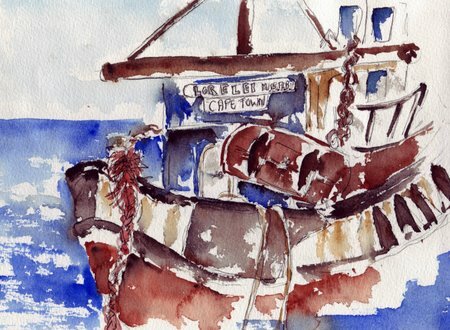 Wonderful watercolours – I adore the Lorelei, she has as much character as The African Queen. This holiday has done wonders for you, Ronell – as you would expect. Your own table by the sea – I’m still dribbling! I love these sketches, so free and easy and colorful and so ‘sea’. Now that I have done a few fast ones, I appreciate yours even more. I love your art Ronell! Welcome Home, Ronell! I can tell you had a marvelous time at ‘home’. 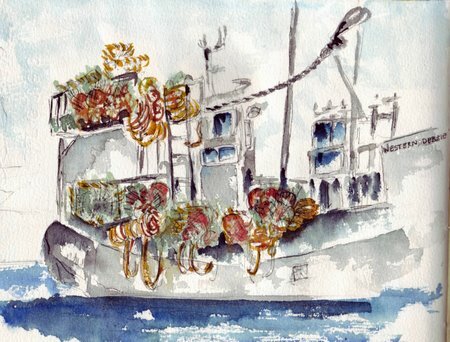 Love your boat paintings! You make it look easy to draw and paint them, but I end up with something looking too amorphous to be any kind of boat. BEAUTIFUL!!!! I so agree with the title, Ronell — free and easy — the boating life — awesomely depicted! My dear friend, I still talk to you, share with you, and laugh with you-even though it has been almost two weeks since you left to go back to your beloved Loir. Reading your “journal” and scetches on your time spent here with us, makes me appreciate what we have here even more! Such wonderful watercolors!! The free, flowing colors are just great. I love all the sketches. I am going to have to start doing more of this myself. More, More, I can smell the breezes and taste the salt – More! well, I can’t pick a favorite…….all as lovely and enchanting as you my friend. I loved the boats with all their nets! I would have thought it too challenging and not even tried to sketch something like that. The colors are striking and evoke the senses even more…I too am drooling. I was by the sea today as well and honestly, there is nothing that compares to the intoxication of ocean breezes! What a beautiful place your south africa must be. What I wouldn’t give to be able to just capture the essense of a thing the way that you do! I love these! maybe with time a practice, I can loosen up and be able to read just the main elements…Your words capture my feeling about living by the sea, they are beautiful. These are all exceptional and exquisite treasures, each more exciting and vibrant than the next. Brilliant work, bursting with the light of the sun reflecting on water. Wonderful!!!!!! Welcome home, Ronell, I’ve missed your wonderful paintings and posts. And these new paintings are just wonderful. I had missed this post somehow – what a breath of fresh air – I can feel the sea breeze! Great stuff, Ronell! Previous Previous post: South Africa chronicles 1- Fynbos.